The more you can define your ideal customer, the easier it is to attract your ideal customer. Why narrow your ideal customer base? It feels counter-intuitive, but the more you focused you are, the greater your chance of business success. It can feel scary to limit our pool of prospects, but the problem is that when you market to everyone, you tend to appeal to no one in particular. People like to feel like a product or service was made just for them. It makes them feel special. It makes them think that you really know what you’re doing and that you’re an expert in helping people just like them. Having a defined ideal client can help you build your brand and market yourself most effectively. People are more likely to buy from you if they can imagine themselves using your product or service. So seeing pictures of other customers who look similar will help them identify and connect with your brand. When you look at people who buy from you, it’s likely you have a mix of different types of people. But think about who is most likely to buy from you. Think about your very best customers and what they have in common. Who are your favorite clients that you’d like more of—the ones who are most profitable, are easy to work with, and refer their friends? There are many ways to define your ideal customer. It’s important to look at both demographic traits and psychographic traits. Defining your ideal customer by demographics means finding one typical client based on age, location, gender, family situation, job title, etc. This is the most common way to define an ideal customer. Think of demographic data as data that could be found in census, tax or other public records. You do not need to have all the details, to have these demographics be important. For example, you likely do not know the household income of your customers, but if you’re selling something expensive it will be best to focus on people with disposable incomes, even if you don’t know their exact income level. location: if you have a brick & mortar location or provide in-person consulting, you are likely confined geographically. age or gender: your product may be targeted towards teenagers or seniors or specifically for mothers of newborns. job title or company info: many B2B products are sold to people in specific jobs, in specific industries or in companies of a certain size. household income: luxury services are just not accessible to everyone, focusing on people who have disposable income will be key. If you want to use targeted media buying—anything from traditional radio spots, to trade journals to Facebook ads—knowing your customer demographics will help you buy ad space that will get your message in front of your ideal client. 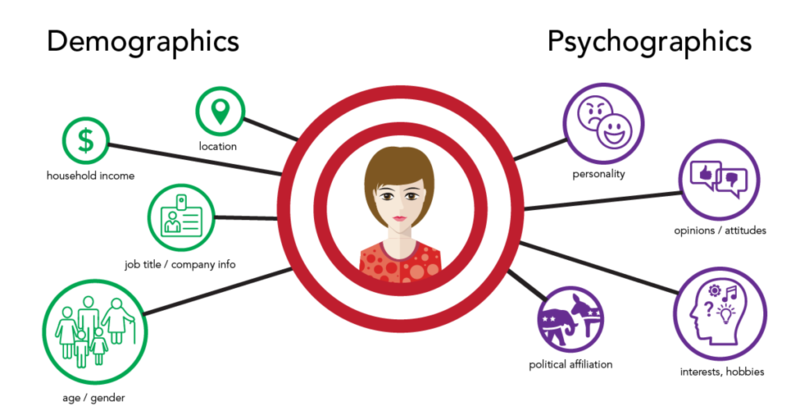 Looking at the psychographic traits of your customers and prospects means focusing on different attitudes, personality traits, values, or interests. For example, maybe you are trying to sell herbal tea. Herbal tea is something that could be consumed by nearly anyone. But you may find your drinkers are focusing on the health aspects of the antioxidants, and that is a trait that is common to your customers, regardless of age, race, gender, etc. personality: are your typical clients more outgoing or introverts? Do they buy from you when they are celebrating or doing something they hate? opinions/attitudes: you may find that your typical customer shares certain worldviews that are not directly related to what you are selling. They may be committed to environmental issues, enjoy certain music genres, or share similar political beliefs. interests and hobbies: This area starts to get close to demographic data if you are trying to sell to a particular group such as running shoes to runners or tennis rackets to tennis players. But it may be more general, for example, an after-exercise recovery drink may appeal to many different types of athletes. While psychographic details can be harder to quantify, they are often central to understanding what drives prospects to buy. We find that mixing demographic and psychographic details helps you create the most accurate ideal client description. With the example of the tea drinkers above, your most likely customers may be middle-aged women who already enjoy tea who are looking for an anti-oxidant rich tea because they are interested in a holistic approach to maintaining their health. Using the Branding Compass tool, you’ll see that you are asked many questions to help you get at the heart of who your most ideal customers are. But challenge yourself to use a combination of demographic and psychographic traits to really pinpoint who is most likely to love your product or service and see its value.